2 Personal Loans The amount of credit extended or the principal of the loan and the interest rate that you may obtain depend on the assurance that you can give the lender that you will be able to repay the loan. Security (or collateral) is anything of value pledged by the borrower that the lender may sell or keep if the borrower does not repay the loan. 3 Personal Loans A personal note is a document (or agreement) that states the terms and conditions of the loan. 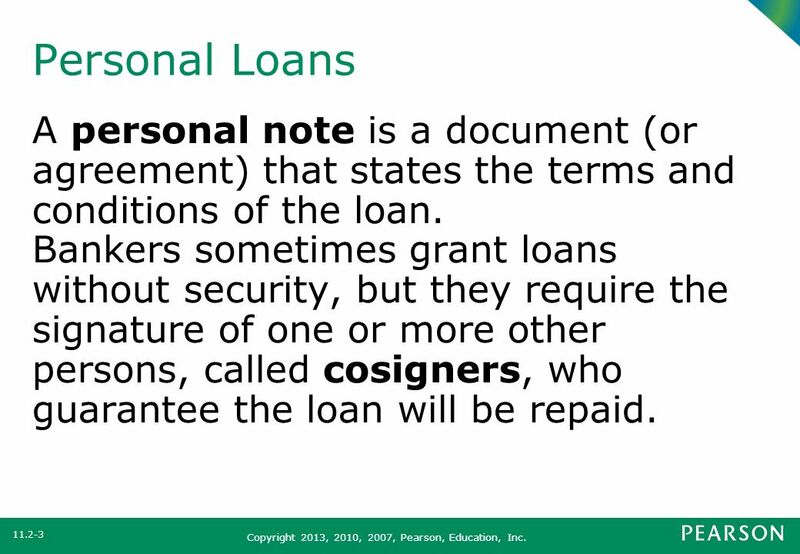 Bankers sometimes grant loans without security, but they require the signature of one or more other persons, called cosigners, who guarantee the loan will be repaid. 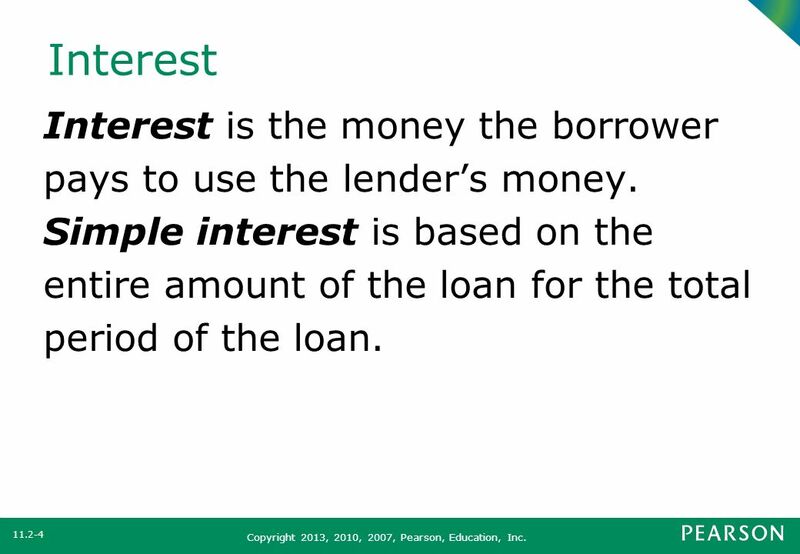 4 Interest Interest is the money the borrower pays to use the lender’s money. Simple interest is based on the entire amount of the loan for the total period of the loan. The most common type of simple interest is called ordinary interest. For computing ordinary interest, each month has 30 days and a year has 12 months or 360 days. 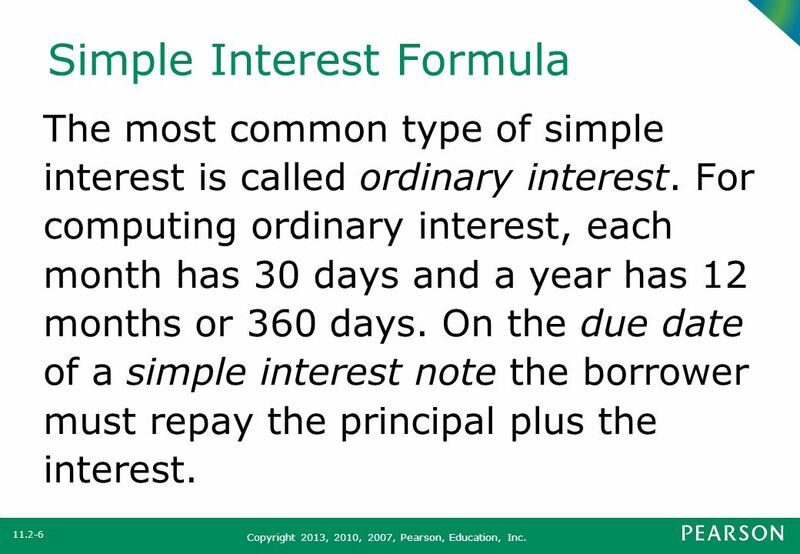 On the due date of a simple interest note the borrower must repay the principal plus the interest. 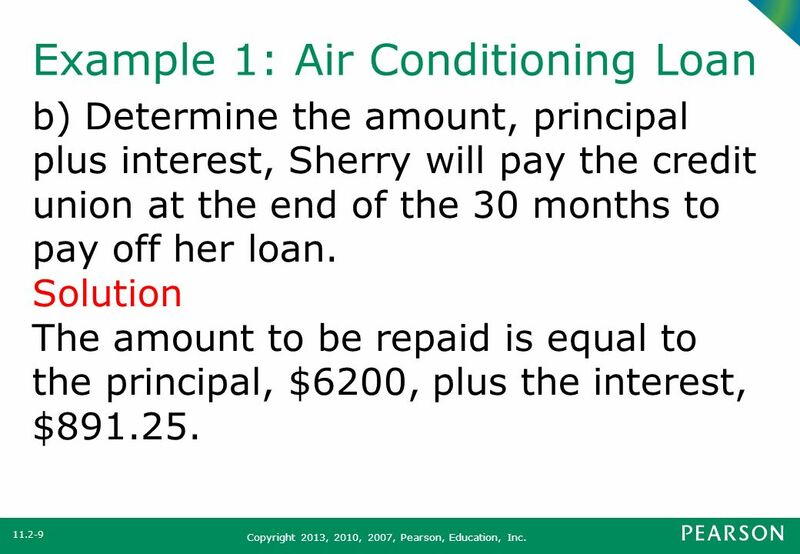 Sherry Tornwall needs to borrow $6200 to replace the air conditioner in her home. From her credit union, Sherry obtains a 30-month loan with an annual simple interest rate of 5.75%. 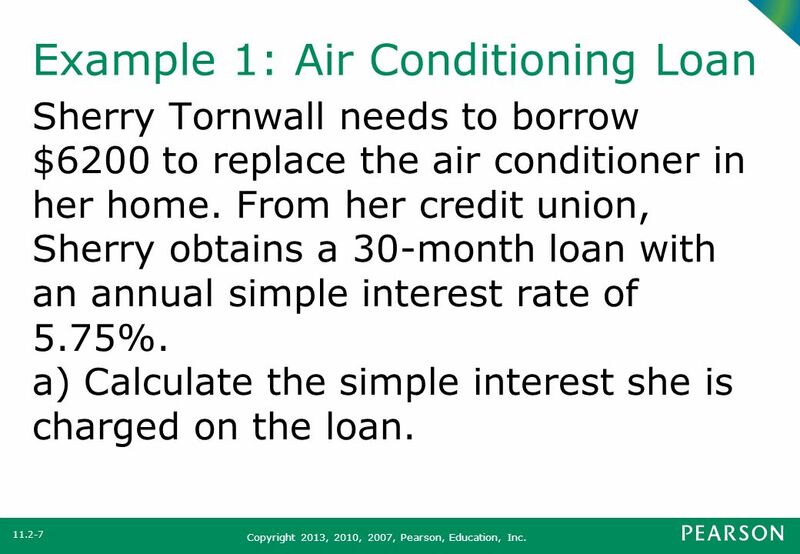 a) Calculate the simple interest she is charged on the loan. 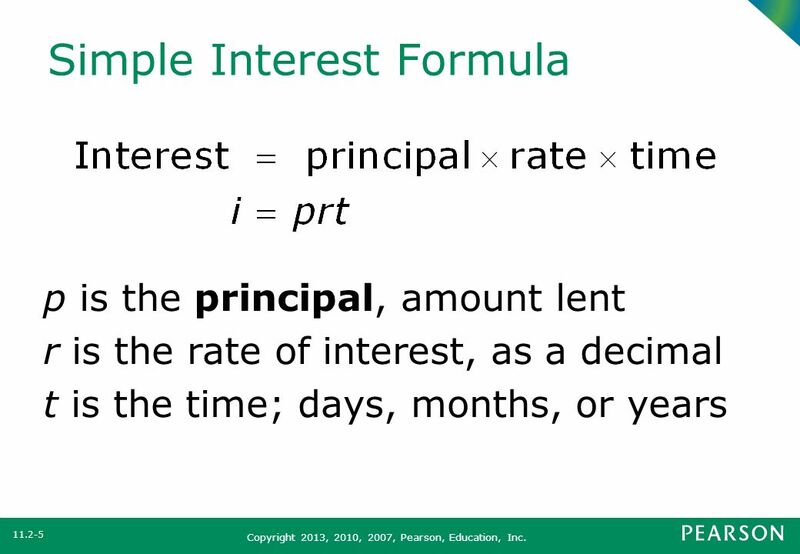 Download ppt "Section 11.2 Personal Loans and Simple Interest"
Unit F: Importance of Investment Lesson 1: Understanding the Concept of Borrowing Money 1. Cost of Credit Essential Question What main factors are included in calculating cost of credit? 1 1. 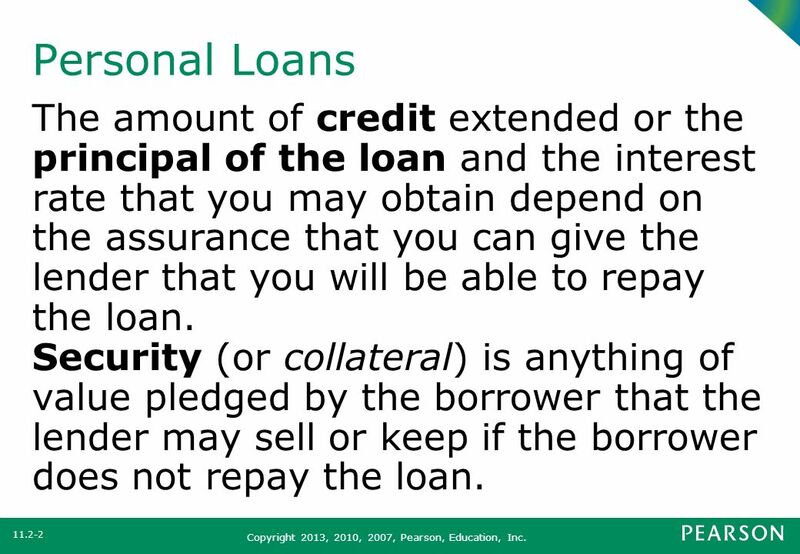 Amortized Loans (MAT 142) Amortized Loans. Earning Credit. Compelling Question Have you ever borrowed money from someone and not repaid it? Or has anyone ever borrowed money from you and not repaid. Warm Up 1. What is 35 increased by 8%? 37.8 Course More Applications of Percents. Pre-Algebra 8-7 More Applications of Percents Warm-up Pink handout #11-14 Turn in pink handout. Notes 31 Simple Interest 6-6. Loans- Chapter 8 Do Now- Jane Dimas obtained a single-payment loan of $420 to pay a repair bill that she did not have the cash for. She agreed to pay. Chapter 11 Section 2 - Slide 1 Copyright © 2009 Pearson Education, Inc. AND. Copyright 2013, 2010, 2007, Pearson, Education, Inc. 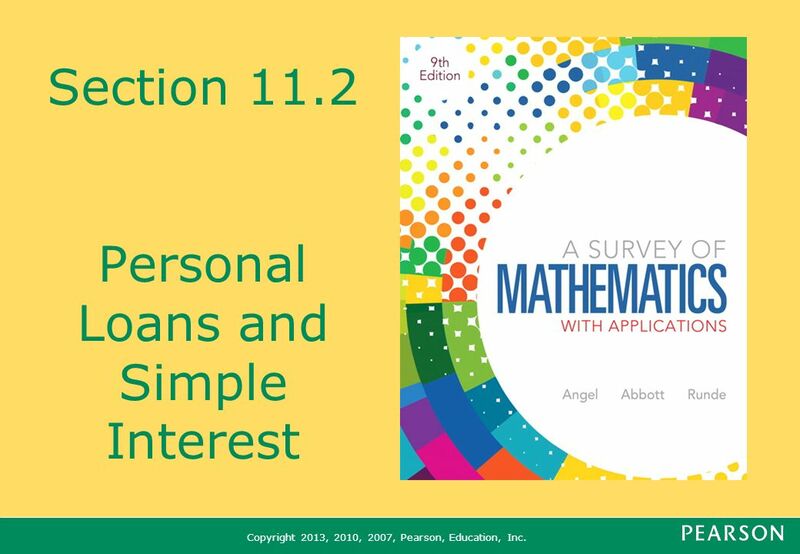 Section 11.2 Personal Loans and Simple Interest. Amortized Loans. Objectives Calculate the monthly payment for a simple interest amortized loan. 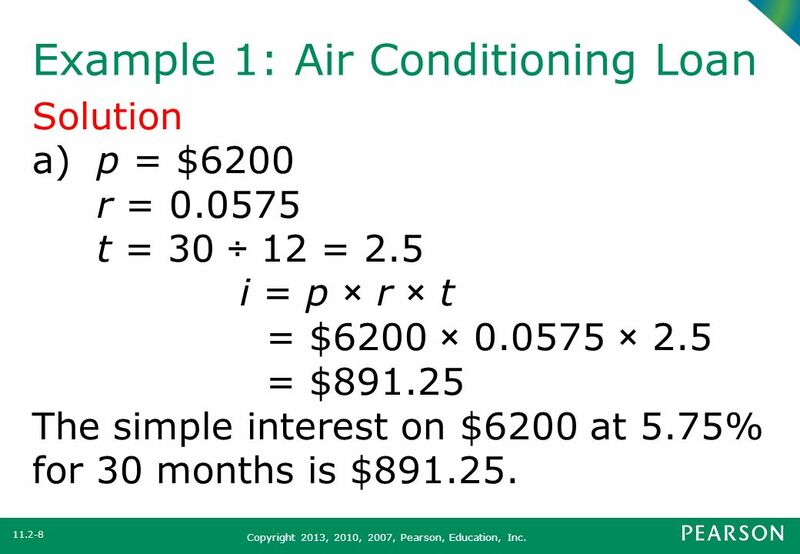 Calculate the total interest for a simple interest amortized. Slide 11-1 Copyright © 2005 Pearson Education, Inc. SEVENTH EDITION and EXPANDED SEVENTH EDITION. Chapter 10 Simple Interest. Chapter 10 Simple Interest. Regular Deposits And Finding Time. An n u i t y A series of payments or investments made at regular intervals. A simple annuity is an annuity in which. Slide 1 Copyright © 2015, 2011, 2008 Pearson Education, Inc. Percent and Problem Solving: Interest Section7.6.